If at first you don’t succeed, try again. Last week’s first foray into Bava was, I think you’ll agree, disappointing. Baron Blood was nothing special, just a ghoulish B-movie helped along a bit by the judicious application of wax dummies and one or two hammy stars. 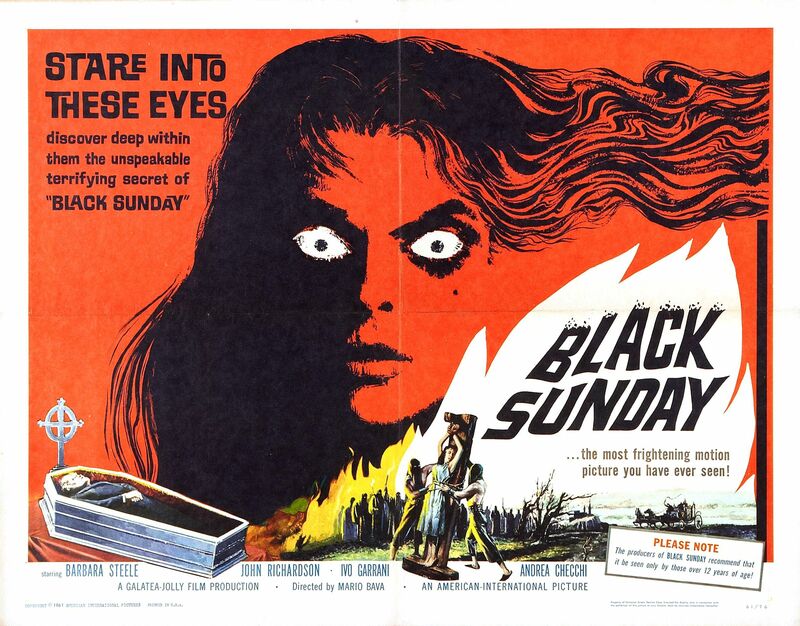 After that letdown, I was a little wary about moving on to Black Sunday. I’d heard it hyped, sure, but would it live up? Or would its iconic opening scene be the only memorable part of an otherwise forgettable entry into Italian horror lore? Boy was I glad to be proven wrong. Black Sunday is talked about a lot for a reason. And that reason is that it’s fantastic. It’s a particularly fun brand of classic horror; the gothic kind with slamming doors, fluttering curtains and eerie reflections in mirrors, and just the right amount of icky corpses, creepy-crawlies and bodily fluids to keep the more blood-lusty horror fans happy. To invoke the words of Owen Glieberman, this movie is a true hellzapoppin’ funhouse jamboree (I knew that phrase would come in handy someday). 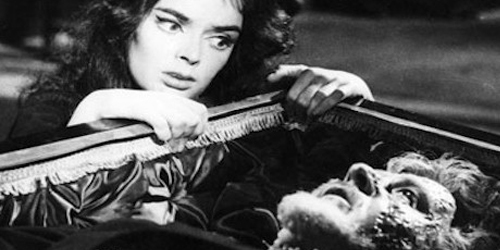 The story: In Eastern Europe during the Inquisition, a witch (Barbara Steele) and her vampire boyfriend are put to death by the witch’s inquisitor family. They’re dispatched in a fittingly gruesome way, burned at the stake, but not before being fitted with a mask lined with wicked metal spikes. It’s attached via a giant wooden mallet. The result, suffice it to say, involves some splatter. The bodies are buried in such a way that they could never possibly be resurrected…or so everyone thinks. 200 years later, a doctor and his young protégé check out the burial site during a pit stop on their way to Vienna. The doctor accidentally causes Steele’s witch—and by extension, her rather unpleasant male companion—to rise from the grave and take revenge on her descendants, who include a young woman (Steele again), who the witch tries to possess. In Baron Blood, Bava’s tricks and gimmickry just seemed like so much theme park haunted house-fodder. It was kitschy, and very dated-looking. Perhaps it’s the black-and-white, or even just the fact that Bava hadn’t made as many movies yet in the 60s, but many of those same tricks are about ten times more effective here. There’s a subtlety to them, as well as mastery in how they’re done. Bava is showing off his considerable skill in practically every frame. He doesn’t wave any of it frantically in the audience’s face, but when the effects come, they are…well, effective. How effective? 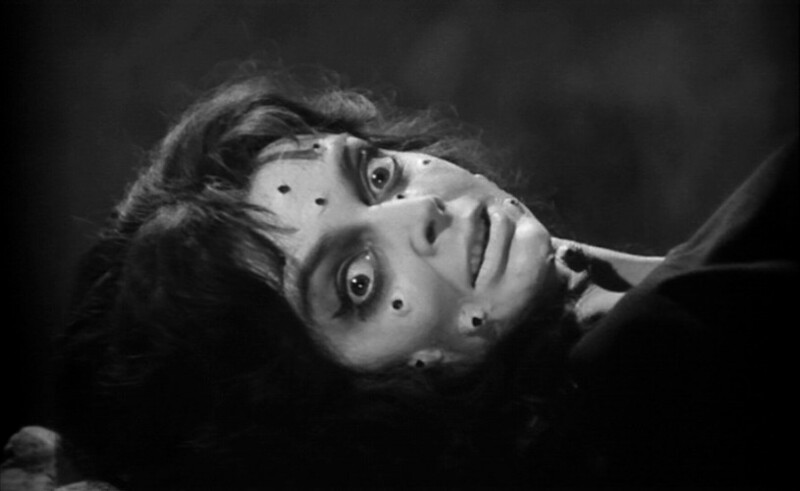 Try Barbara Steele’s half-decayed corpse crawling with scorpions, and (later) maggots. It’s enough to send a chill down any horror fan’s spine and make them giggle like Ron Swanson at an all-you-can-eat bacon buffet. At the same time. Which brings us to Steele herself. She makes a great, uniquely gorgeous leading lady (check out those cheekbones!). As Katia, she makes a decent damsel in distress. But as the witch, Asa Vajda, Steele is given the freedom to be as crazy as she wants. Fortunately, she goes for just the right amount—angry, manic and straight-up evil without being too screechy and turning Asa Vajda into an obnoxious ghoul. It’s total commitment, and you can tell she’s having lots of fun. When the movie does choose to switch its focus more towards Katia and her relationship with the young doctor, the movie slows down a bit too much—it lacks the campy thrills and sense of fun that automatically jolts into being any time its villain shows up. But Black Sunday’s wilder bits are more than enough to make up for any loss of momentum in its last third. For the most part, the movie retains the creepy, wackadoo-gothic atmosphere it showcases in its opening. It’s gooey, squeal-inducing fun that may not haunt your dreams, but will certainly give you pause the next time you walk past a cemetery.